Hi, my name’s Pema Donyo. I’m a full-time finance professional, part-time author, and at-all-times coffee lover. 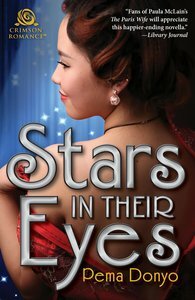 My latest novella is Stars in Their Eyes, a historical romance. Prior to that, I’ve written a Young Adult thriller (The Innocent Assassins), and other historical romances (Revolutionary Hearts, One Last Letter). I am represented by Tara Gelsomino of One Track Literary. I believe creativity can be infused into all endeavors, whether building a brand new story world or solving a quantitative problem. Creativity can be (and should be) applied to all aspects of life! Sign up to find out about new releases here.